The easy, sustainable way to have your most desired spices on hand at all times. Fresh herbs can sometimes be seen as a bit of a delicacy. They’re convenient, and make life easier since you won’t have to buy the dried versions. You may also notice a difference in the taste of your food once you start incorporating fresh herbs in your dishes. So, why not try growing a couple of herbs in your kitchen? We dug around and came up with a few tips you can use to keep fresh herbs in your kitchen! Herbs grow the best in locations with plenty of light. Place your herbs in either north- or east-facing windows. If you don’t have a window to place your herbs in, then supplement the lighting with a full-spectrum lamp. West-facing windows also tend to receive some sun but can be much warmer due to the sunlight coming in throughout the afternoon, so it may end up burning the leaves of your plants. There are also small kits that come with their own lighting so you can grow your herbs in the kitchen without any hassle. 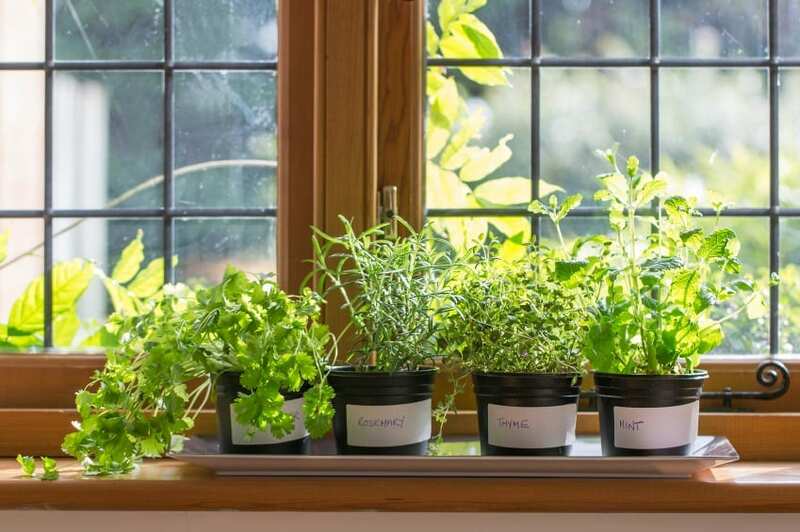 Placing your herbs in the windowsill will help to maximize the amount of sunlight they receive. When deciding which herbs you’re going to grow in your kitchen, go for leafy herbs like basil. Not only are they easy to harvest, but they’re easy to prune too. Just clip the foliage off as needed to encourage your plants to grow more leaves. Leafy herbs also grow very well in containers, and some varieties grow smaller so that your kitchen doesn’t start to look like a mini jungle. Having your herbs year-round is possible. If they’re in containers indoors, it makes it even easier. Be sure to give your plants plant food once a month so they can continue to grow and provide you with fresh herbs. If your herbs don’t have any of the nutrients they need, they will eventually die off. Usually, a spoonful or two of plant food will do the job. Leafy herbs like basil tend to grow the best in kitchens and are easy to prune. Watering your herbs can become a quick, relaxing routine you’ll find yourself enjoying immensely. You’ll want to be careful that you don’t over-water your herbs though! Allowing them to sit in soggy soil, or even pots in a tray of water can lead to root rot and cause them to die off. Only water when the first couple inches of the soil becomes dry. That’s when it’s a good sign it’s time for your herbs to be watered. Herbs can become a little “leggy” when grown indoors. The best way to prevent this is to rotate them regularly. It will help your plants to grow straight and prevent them from preferring one side due to sunlight. All sides of your plant should receive an equal amount of light to grow healthily and evenly. Those are several tips to grow your herbs indoors. We hope you enjoy using them in the future! Growing fresh herbs is a great way to improve the taste of your dishes, as well as bring a splash of color to your kitchen. Vanilla Cupcakes with Licorice Frosting!